Mission: To protect the residents of Wichita/Sedgwick County from the adverse effects of tobacco. WASHINGTON, DC — A respected national survey of teen substance abuse has truly shocking news that should sound an alarm at the FDA: Significantly more teens reported recent use of e-cigarettes than traditional cigarettes in 2014. Released today, the government-sponsored Monitoring the Future survey is the first national survey to show teen use of e-cigarettes surpassing use of regular cigarettes. It follows the release in November of the CDC’s 2013 National Youth Tobacco Survey, which found that e-cigarette use among high school students tripled between 2011 and 2013 (from 1.5 percent to 4.5 percent who reported using e-cigarettes in the past 30 days). Among 8th graders, 8.7 percent reported using an e-cigarette in the past 30 days, while only 4 percent reported using a traditional cigarette. Among 10th graders, 16.2 percent reported using an e-cigarette and 7.2 percent reported using a traditional cigarette. Among 12th graders, 17.1 percent reported e-cigarette use and 13.6 percent reported use of a traditional cigarette. In addition to these surveys on youth e-cigarette use, the American Association of Poison Control Centers reports that poisoning incidents involving e-cigarettes and nicotine liquids continue to soar. Through November 30, there have been 3,638 calls to poison control centers involving exposures to e-cigarette devices and nicotine liquids. This is more than double the 1,543 calls in all of 2013 and more than 13 times the 271 calls in 2011. The big increases in both youth use of e-cigarettes and poisoning cases show that e-cigarettes are a clear and present danger to our children. How much more evidence does the government need before it acts? Source: "New National Survey: More U.S. 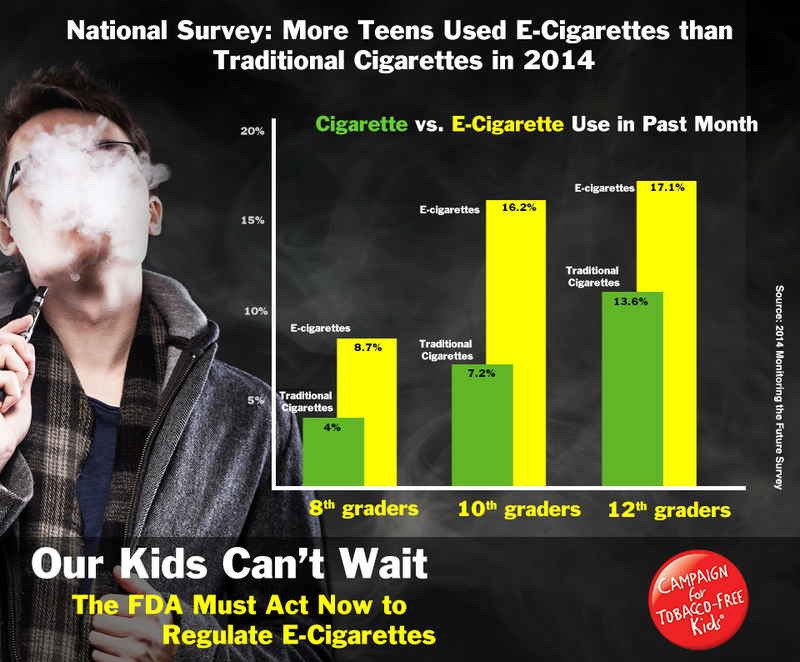 Teens Used E-Cigarettes than Traditional Cigarettes in 2014 - Campaign for Tobacco Free Kids." Campaign for Tobacco Free Kids, 16 Dec. 2014. Web. <http://www.tobaccofreekids.org/press_releases/post/2014_12_16_ecig>. Get More TFW in Your Inbox! Enter your email address to to follow TFW & get notified about new posts. Join Us at Our Upcoming Events!